The Dead Zone. Fish kills. Hypoxia. We increasingly hear these terms on the news every summer—so what is going on in our estuaries? The main cause of various problems in our waters is hypoxia, or reduction in dissolved oxygen in the water, which is generally defined as dissolved oxygen levels below 2 mg/L. 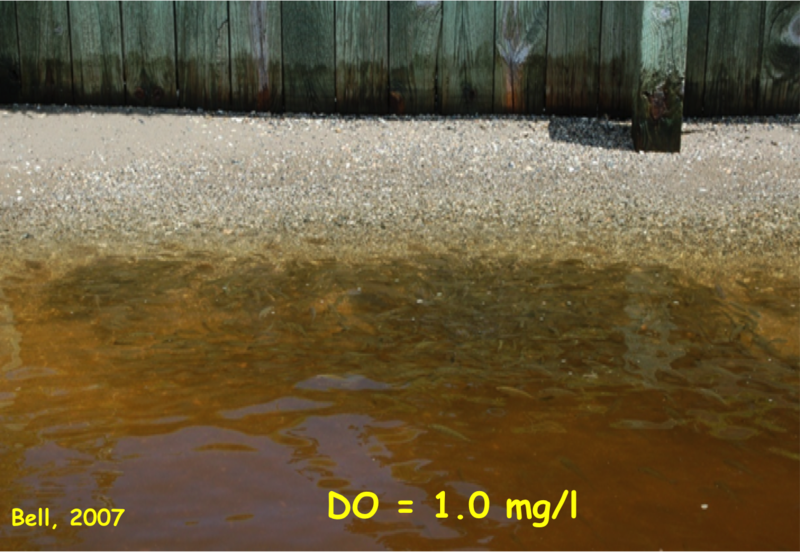 However, complications to fish and aquatic life often begin at levels below 4 mg/L. An escalation of hypoxic events and durations has been seen around the U.S. in the past decade. Although fish don’t breathe as humans do with lungs and air, they still take in oxygen from the water as it goes over their gills. Reduction in oxygen in the water is similar to what hikers experience at high altitudes where the reduced oxygen air is considered “thin.” Just as we humans would get short of breath, tired, and less active, fish experience the same type of problems when oxygen is depleted from their waters. 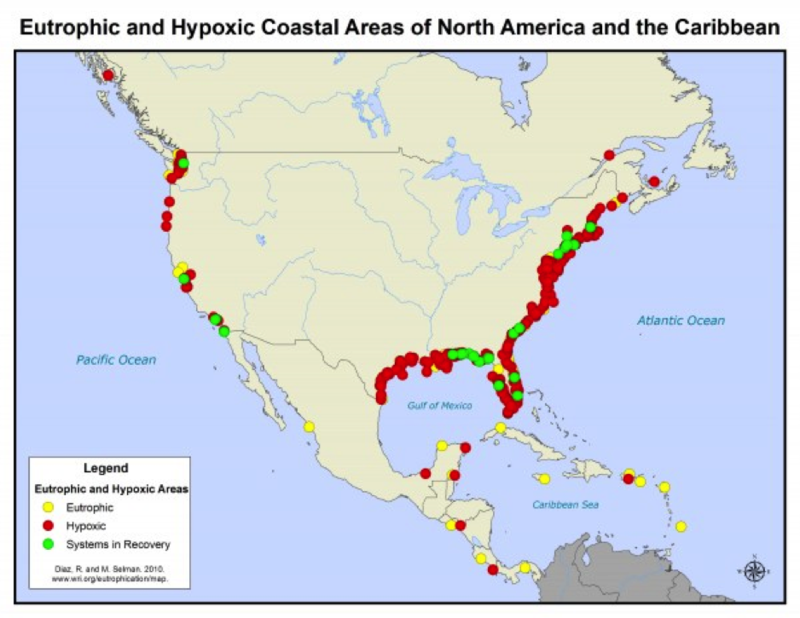 So what causes hypoxia in rivers, bays, estuaries, and oceans? The short answer is that as excess nutrients enter these systems, large amounts of aquatic plants and algal blooms (some toxic) quickly develop. Although this may seem like a good thing—extra plants, production, food!—this extra organic matter dies and sinks to the bottom of the systems. The subsequent decaying processes drain oxygen from the waters creating hypoxic conditions that are not quickly alleviated. 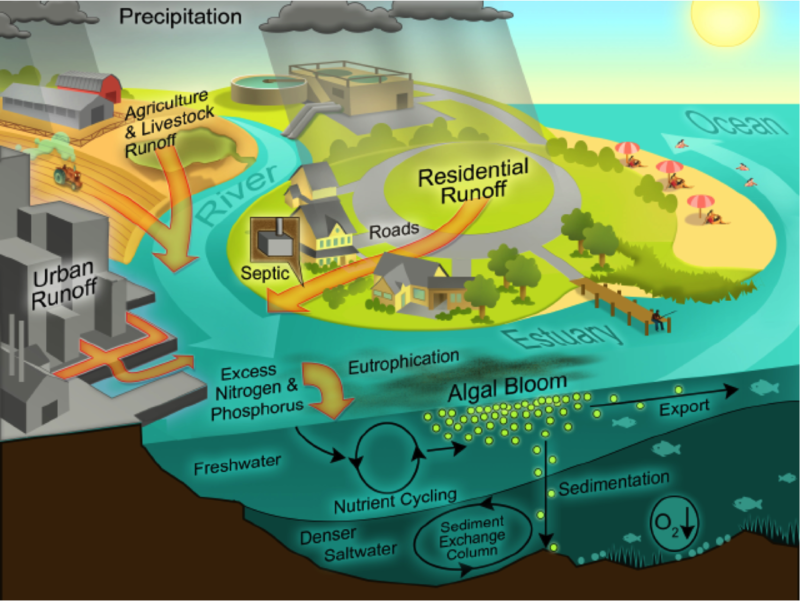 Excess nutrients come from many sources, although fertilizer and waste runoff from agricultural lands has traditionally been the main point source. However, as populations grow and urbanization increases, non-point sources of nutrients are growing. Increased impervious surfaces send water (and all nutrients collected in that water) directly into rivers instead of waters filtering through the ground. In pursuit of a picture perfect green lawn excess fertilizer is washed into the watershed. This might not seem like that much of an increase, but when you multiply that by the hundreds of thousands of yards in a watershed, a lot of fertilizer is making its way to our estuaries. 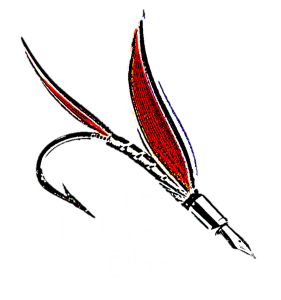 Fish kills are a highly visible consequence of hypoxia, but these events are relatively rare compared the widespread non-lethal hypoxic conditions that occur. Fishes can generally detect and avoid hypoxic waters, but doing so causes other problems for the fishes. To avoid hypoxic waters a fish must expend extra energy swimming and finding appropriate habitat. If an oxygenated refuge is found fish must then compete in these smaller areas for space and limited food resources. My work with fish distribution during hypoxic episodes showed a two-fold increase in fish densities in refuges and a reduction in stomach fullness of juvenile spot (Leiostomus xanthurus). Many times larger predators are also pushed into compacted refuges increasing encounter rates and mortality for juvenile fishes. Beyond immediate impacts of hypoxia in fishes, some of my recent work shows that fish in areas with numerous recent hypoxic events had a reduction in short-term growth rates by almost 50% than fish in the same areas after periods of no hypoxic events. Although fish may have successful avoidance strategies to reduce immediate death from hypoxia, they still pay a price. And reduction in growth can result in higher mortalities, less over-winter survivability, and decreased biomass production of the fishery. Wu (2009) found that fish exposed to hypoxia had reduced reproductive abilities, thus hypoxia of today effects fish generations of tomorrow. These are just a few of the far reaching consequences of hypoxia, as further and prolonged hypoxia fundamentally changes an ecosystem and alters physical, chemical, and biological structures. Hypoxia is a serious problem, but making changes in our water systems can lead to improvements in the oxygen levels, if we act now. Spreading Dead Zones and Consequences for Marine Ecosystems. Diaz et al., 2008, Science 321, 926. Effects of Hypoxia on Fish Reproduction and Development. RS Wu, 2009, In Hypoxia. Fish Physiology Volume 27, pages 79-141. Nice article with some great take-home messages! My next comment is a bit of a tangent but might be of interest to some: something to keep an eye on is that the recent natural gas production boom could result in increased synthetic (ammonia-nitrogen) fertilizer use. Most of the cost of ammonia production is in natural gas; the hydrocarbons are actually used as an ingredient as well as fuel. Because natural gas prices are currently so low, it has become much cheaper to produce nitrogen fertilizer.